Walter Ronald Champion of Moose Jaw and formerly of Pasqua, SK passed away on Monday, July 2nd, 2018 at the age of 96 years, with family at his side. The Funeral Service will be held on Friday, July 13th, 2018 at 11:00 a.m. in St. Aidan Anglican Church, 124 1st Ave NE, Moose Jaw, SK. Interment will take place at Rosedale Cemetery. Walter was born May 3rd, 1922 in Lemsford, SK and lived in Whitewood, SK for a short time before moving to the family farm at Pasqua, SK in 1930. He grew up there, working hard beside his father on their dairy and grain farm during his school and young adult years. During the war years, while continuing to work on the farm, Walter served with the Kings Own Rifles of Canada army reserves attaining the rank of Sergeant. He purchased his own home in the hamlet of Pasqua in 1946, renovating it in preparation for his marriage to Marjorie Goodfellow on June 23rd, 1951. They lived their entire married life there (58 years), lovingly raised their two children there and Walter remained there after Marjorie’s passing until failing health forced him to move to Moose Jaw about 7 years ago. 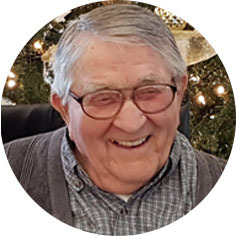 The same year he married Marjorie, Walter began a successful 37 year career as a plumber working for Richardson and Dracup Plumbing and Heating and at the end of his career, Wesmor Plumbing and Heating, both in Moose Jaw. Walter was active in the Pasqua Avian Club as a youth, and as an adult, in the Pasqua Community Club, Pasqua Drama Club, The Anglican Church, camping clubs, square and round dancing clubs, and the White Hackle Boys Pipe Band. Walter was a family man and a country boy at heart. He was happiest when he was outside listening to the birds, mowing grass, trimming trees, blowing snow, puttering away at some project, or just sitting enjoying the warmth of the sun and the breeze blowing in his face, a passion he shared with both of his children. He was predeceased by his wife, Marjorie in 2009; parents, Maud and Roy; brothers: Lawrence (Erie), Cecil (Doreen), Jack (Ethel), and William; sisters, Gertie (Leo) Aitkin, and Stella (Jim) Gill; in-laws: William and Mary Goodfellow, Arthur (Hilda), Les, and Norm (Gladys) Goodfellow. Walter will be lovingly remembered by his daughter, Arleen (Robert Nelson, step-grandson Mark and great-granddaughter, Eris); son, Brian (Marge); grandchildren, Steven and Breanne; sister, Mildred Morris; sisters-in-law, Val Goodfellow, and Donna Champion; brother-in-law, Bill Seman; and numerous other relatives. Flowers are gratefully declined. As an expression of sympathy, donations in Walter’s name may be made to the St. Aidan Anglican Church, 124 – 1st Ave NE, Moose Jaw, SK S6H 0Y9 or to the Pasqua Community Club, Box 1214, Moose Jaw, SK S6H 4P9.